Mainland singer Jane Zhang, winner of Super Girl, a Chinese version of American Idol, sings the theme song in Lee's Adventure, a film starring Jaycee Chan, son of Jackie Chan. The song is part of Zhang's new album, Change. 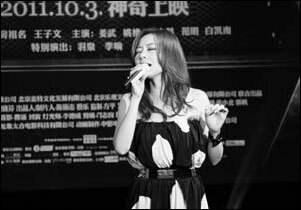 Zhang was second runner-up in Super Girl in 2005 and was the first Chinese pop singer to appear on Oprah Winfrey's show. The film will premiere on Oct 3.